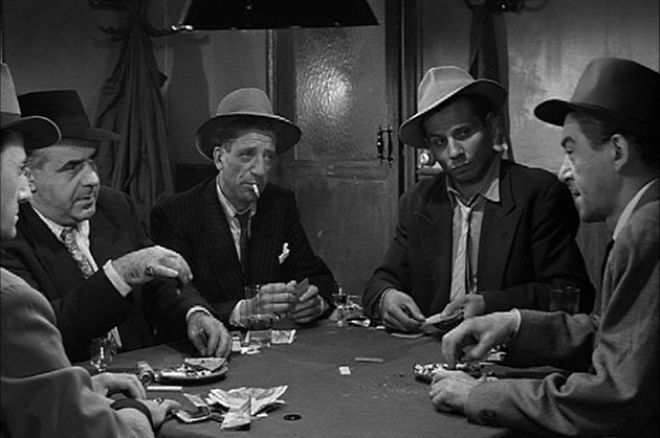 Richard Widmark is a compulsive gambler who keeps looking for that one big score in a poker game. Widmark is typically excellent and the story is--for the most part--really good, but I think the ending is weak. During its five year run, The Twilight Zone did a total of 8 episodes partially or completely set in the Old West. 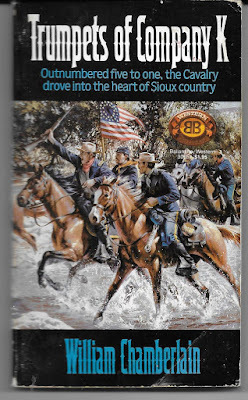 There were several Civil War episodes (at least 3 that I can think of), but for our purposes today, we are going to stick to gunfighters, settlers and outlaws. I'm going to do an intermittent series looking at those episodes one at a time. I'm doing this series because.. well, because its my blog and I want to. Also, its an excuse for me to watch some Twilight Zone episodes again, which is never a bad thing. "Mr. Denton on Doomsday" aired on October 15, 1959--it was the third episode of the series' premiere season. 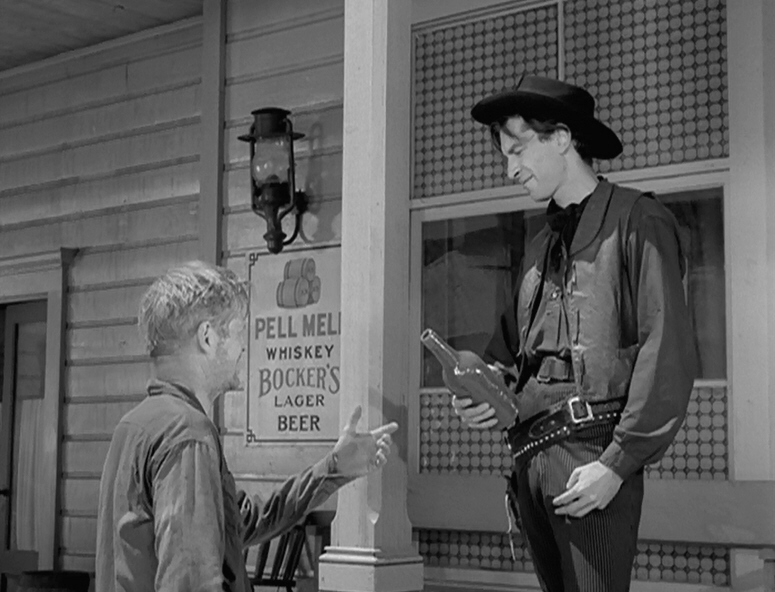 Written by Rod Serling, it isn't often listed among the best episodes, but it really is quite excellent. 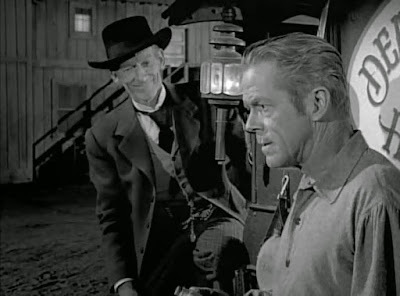 Dan Duryea is Al Denton, the town drunk--a former gunfighter who had long ago drank away both his skill and his dignity. A local bully (Martin Landau) forces Denton to literally sing for a drink. But then Denton finds a pistol lying in the street. It goes off by seeming accident, with the shots disarming the bully. Suddenly, Denton has the respect of the town. It's not just Al or "rummy" when they speak to him. It's "Mr. Denton." It was here that the story could have gone in two different, equally legitimate directions. Denton could have regained his confidence and, in fact, become arrogantly over-confident. The story would have then probably played out as a tragedy. But instead, Denton does regain his dignity, but also realizes that he doesn't stand a chance in a real gunfight. And now that he's regained his reputation, it's only a matter of time before someone looking to make a name for himself calls him out. He knows he's doomed. Duryea was a great character actor and its his performance that really makes this episode great. Though the half-hour format does force the plot and character moments to unfold a little too quickly, Duryea brings a pathos and later a sincere sense of dignity to Denton. It's one of the things that made The Twilight Zone such a classic series: in the best episodes, we are shown characters we can easily think of as real no matter how overt the supernatural or fantasy elements are. Because this IS The Twilight Zone and so of course there's a supernatural element to the story. A peddler named Henry J. Fate is somehow responsible for Denton's lucky shots after Denton finds the gun. And later, when Denton is about to face off against a younger gunman (played by Doug McClure), Fate gives him a potion that will make him the fastest gun alive for ten seconds. But Denton's opponent turns out to have the same potion. 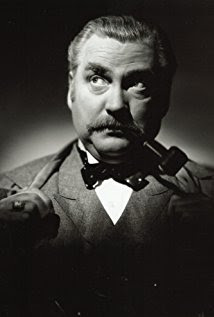 The story uses this plot twist to pull a satisfying and legitimately uplifting climax out of this situation, with the combination of Sterling's solid script and Duryea's fine performance endowing it with honest emotion. 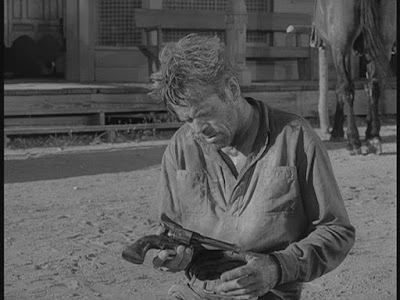 So The Twilight Zone's first trip to the Wild West is a successful one. There's one more journey back to that time period in the show's first season. Well, sort of. We'll take a look at an episode that is set mostly in the 20th Century, but still draws its main character from the 19th Century. Never Bring a Puma to a Gunfight! "The Plunderers," from Rawhide Kid #55 (December 1966) was written and drawn by Larry Lieber. I'll admit upfront that I like Lieber's art, but I'm not usually knocked dead by it. His work is servicable and enjoyable, but doesn't particularly stand out. But in this story, Lieber really had his game on. His script is a perfectly good one, but it's his art, with a very effective use of shifting camera angles and some well-choreographed fight scenes, that make everythying click. The Kid meets a family of poor farmers, who assume there's a reward and arrest him. Not wanting to fight innocent people, the Kid allows himself to be taken into town. He's not wanted in this particular county, though. But while he's in jail waiting for the sheriff to check up on him, he sees the patriarch of the farming family getting roughed up by some thugs. When he's released, he runs to help the farmer. But the farmer assumes the Kid is working with the thugs and some of the townspeople jump him as well after also automatically assuming he must have busted out of jail. That leads to the first of several action sequences as the Kid fist-fights his way out of town. Determined to help the farmer regardless, he rides out to their homestead. Here he discovers a rich rancher is trying to run them off the land so that he can grab it for himself. The farmer and his two kids don't trust the Kid at first, but when the bad guys attack, they are forunate to have him around. This leads to yet another effective action scene, in which the Kid takes out most of the rancher's gang, despite the use of a haywagon to smash into the farmer's house. This flows into the climatic scene. 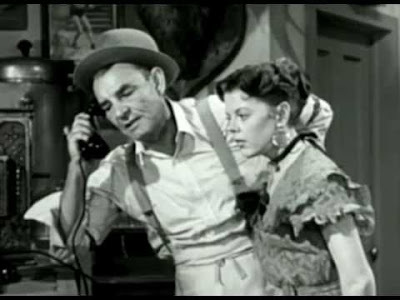 Using the farmer's daughter as a hostage, the rancher flees back to his own place. The Kid pursues, so the villain releases his pet puma. This tactic quite literally comes back to bite the rancher. The story is structured to give us one nifty fight scene after another and, because Lieber's art stands out, it works really well in this regard. 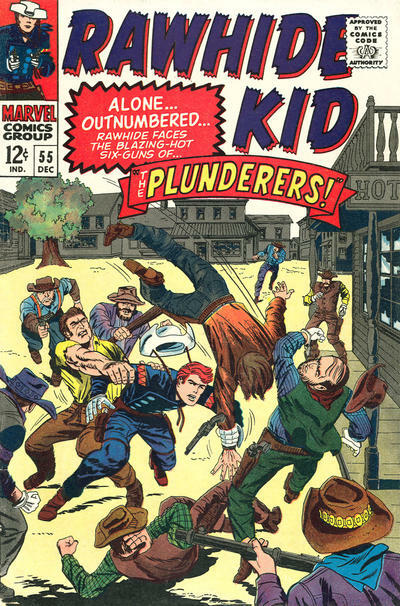 It can be said that the Rawhide Kid stories were stuck in the same rut--he's always distrusted by the people he meets and this always forces him to move on in the end even if he has made a few friends. But within that framework, some very entertaining stories were told. We've visited with Turok and Andar recently, but I've acquired an unusual multi-part story arc from that series, so we'll return to Lost Valley next week. A Richard Loehle cover from 1949. A baby is left on the tavern's door step. Could the little one awaken paternal instincts in the child-hating Archie? There are moments when life is unequivocally good. 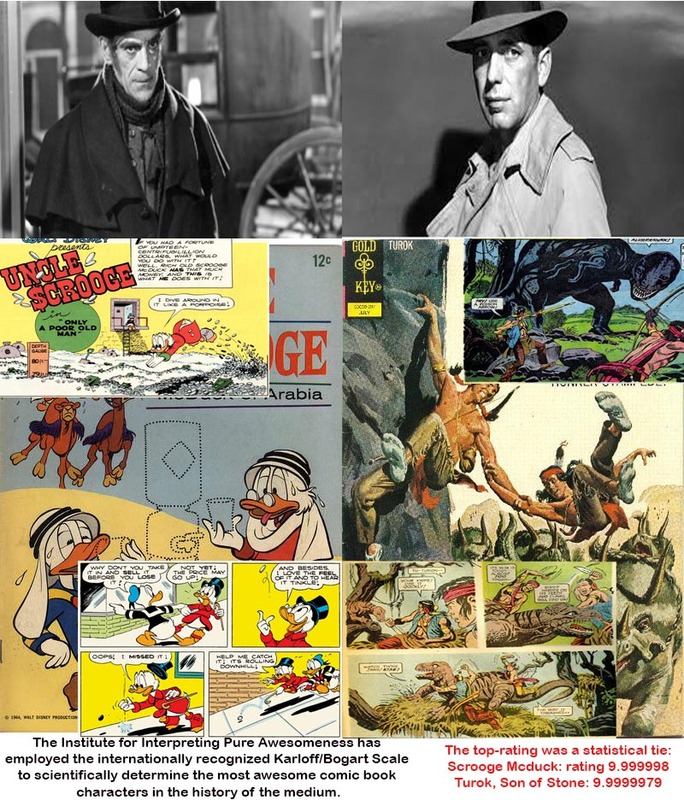 A Friday night with nothing important to do and no immediate responsibilities; a playlist of Western movie soundtracks playing on my computer; a couch to lie on; iced tea to sip and a good Western to read. Who needs friends or useful tasks to perform? THIS is what makes life good. The particular Western I was reading on that recent Friday night was Trumpets of Company K, by William Chamberlain. I had read an anthology of Chamberlain's World War II-themed stories when I was a kid and several years ago completed a life-long quest in identifying the author and reading those stories yet again. A few months ago, I reviewed his excellent WWII novel Combat General. Chamberlain was an army officer himself, serving with distinction during World War II and retiring in 1946 at a brigadier general. He knew his stuff and his main characters are usually officers and represent the qualities that a good combat officer needs to have. His first book-length work is not a World War II story, but a Western. The main character, though, is still representative of the qualities of a good leader who takes men into combat. Some things never change. Frank Garland is a captain and company commander in the cavalry, serving at a remote fort in the Dakotas a few years after Little Big Horn. And though the post might be remote, there is no shortage of trouble. There are rumors of a land grab, to be led by a powerful senator, which would mean land being taken away from the Sioux despite previous treaties. Because of this, a band of Sioux has left the reservation and already killed a number of people. A lieutenant leading a patrol made poor decisions, getting two of his men killed and getting himself captured, That the lieutenant is the son of the senator arranging the land grab complicates that particular situation even more. A former officer, cashiered for being drunk on duty during an Indian raid that left Garland's wife dead, has arrived in the area and is rumored to be providing the Indians with guns and whiskey. He also claims to be an agent of that senator. So Garland and the fort's commander, Major Kingman, have all this to deal with. Also, Janet Davenport, who is engaged to the captured lieutenant, has arrived at the fort and blames Garland for sending him out on patrol. The story that flows out of these interrelated plot points is suspenseful and thoughtful. Chamberlain centers most of the story around Garland, but also cuts away to the enlisted men from time to time to give us their points of view as well. The end result is a very suspenseful tale peppered with an intelligent and sharply-presented discussion of why men choose to be soldiers, of the Band of Brothers mentality that is so important to small units in combat, and of the responsibilities a combat leader must recognize and fulfill. 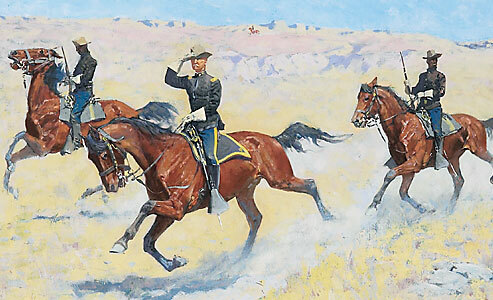 Art by Frederic Remington. It's not from the novel, of course, but it's pretty awesome in its own right. There's not a lot of pure action, but its a story that doesn't require it, as Chamberlain keeps the events of the novel moving along briskly and various character moments stand out. I especially like the character arc of Major Kingman, the fort's C.O. He is determined to confront the senator and stop the land grab, thus preventing the war that the senator wants to use as an excuse for that land grab. Kingman knows he can't win--the senator has too much political pull and will without question bring Kingman's career to an end. But the officer knows right from wrong. He knows his duty both to his country and his men. He may go down in flames, but he will stand up and fight. He is awesome. Trumpets of Company K isn't a perfect novel. Garland and Janet end up in love with each other, which is predictable and happens far too quickly--before the two even have a chance to have a real conversation, they are pretty much up to their eyes in mutual mushy feelings. But this is the only false notes among the strong characters in this excellent Westerns. Everyone claims dinosaurs are extinct! But not only do they exist in Pal-ul-don, Caspak, Pellucidar, Skull Island, Challenger's Plateau and the Valley of Gwangi--it also turns out that they are living on Saturn's largest moon as well! We learn this from the story "The Eagle of Space," from Wonder Woman #105 (April 1959). Written by Robert Kanigher and with art by Ross Andru, it shows us that there are definitely dinosaurs on Titan. By the way, I'll get a minor annoyance out of the way upfront. When the story takes Wonder Woman and Steve Trevor to Saturn's biggest moon, it is simply referred to as "Saturn's biggest moon," never as Titan. Gee whiz, Mr. Kanigher, I realize you couldn't just google something in 1959, but couldn't you have taken a moment to crack open an encyclopedia and find moon's name? On to the story. Unmanned rockets sent to explore Mars keep vanishing. A picture transmitted back by one rocket show a picture of a pterodactyl attacking the ship. Steve Trevor doesn't believe this could be true, so takes a manned rocket up into space to check out the situation. Somtimes Steve isn't the brightest marble in the bag, is he? First, he thinks going up alone is a good idea. 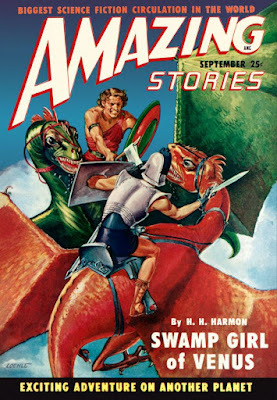 Second, his girlfriend is an immortal Amazon with super strength and an invisible plane, but he thinks a space-pterodactyl is impossible. Not just unlikely, mind you, but impossible. 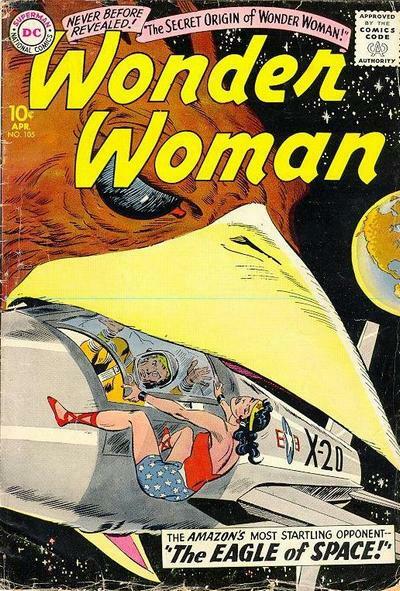 Wonder Woman tails Steve in her plane, so is on hand to rescue him when the pterodactyl attacks. Shenanigans ensue, which result in Steve joining Diana inside her plane, which in turn ends up in the jaws of the pterodactyl. Flying in a "cosmic jet stream," the creature quickly returns to Titan. This turns out to be a jungle world on which dinosaurs still live. No explanation for how at least one of them became able to survive in an airless void is ever given. A T-Rex and the pterodactyl starts playing keep-away with the invisible plane. This results in Diana and Steve getting separated. 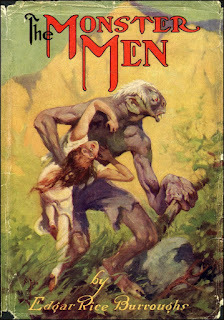 Diana finds a tribe of cave people, primitive humans who are kept in perpetual fear by the dinosaurs. Diana later finds Steve, then builds a cage with giant trees to keep the tribe safe from the dinosaurs. Wonder Woman then caps all this off by telepathically passing on all knowledge of civilization to a young caveman. She and Steve then head home. This is a fun, delightful story. It would be easy to pick holes in it--by golly, how DID the pterodactyl become capable of breathing in space? But, though I normally prefer strong plots that follow their own internal logic, I just can't get bothered over this. The idea of dinosaurs living on Titan, combined with Ross Andru's always-fun artwork, sells the story to me hook, line and sinker. 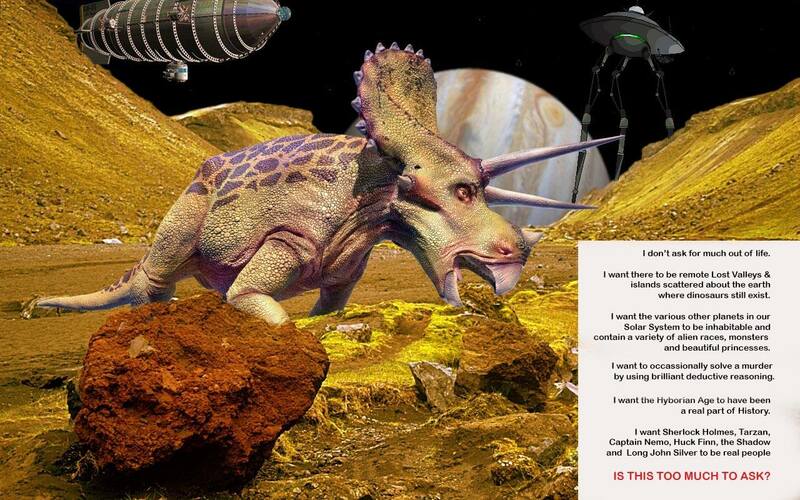 Besides, I knew there were dinosaurs still living on Titan. I just KNEW it! Next week, we'll return to the Wild West to visit with the Rawhide Kid. Jess Terrell, Scott Stewart and myself talk about ERB's second Tarzan novel: The Return of Tarzan. This is one of Burroughs' best novel and a personal favorite of all of us. 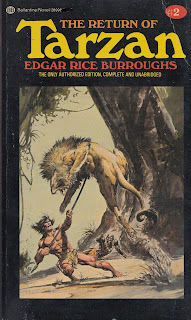 The plot stretches from Paris to North Africa to the jungle to the lost city of Opar as Tarzan struggles to discover if there is a place for him in civilization--or if he even wants to be a part of civilization. You can listen or download HERE. A C.C. 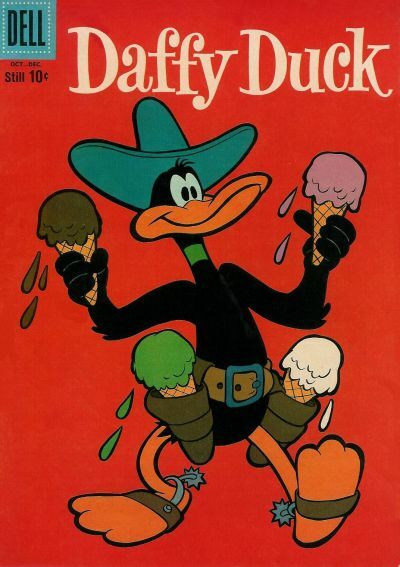 Beck cover from 1946. Everything Beck drew drips with a sense of pure fun. Holmes and Watson are tasked with double duty: Find a missing heir and prevent an old man from being frightened to death. "Fly Paper" was a Continental Op story. Published in Black Mask in the August 1929 issue. 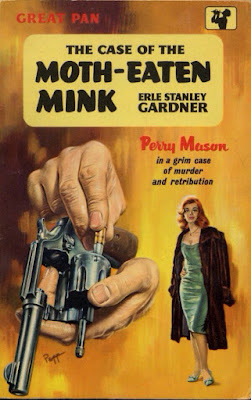 This was one of Dashiell Hammett's later stories, written when he was at the top of his game and getting ready to produce the serials that would later be published as the brilliant novels Red Harvest and The Maltese Falcon. 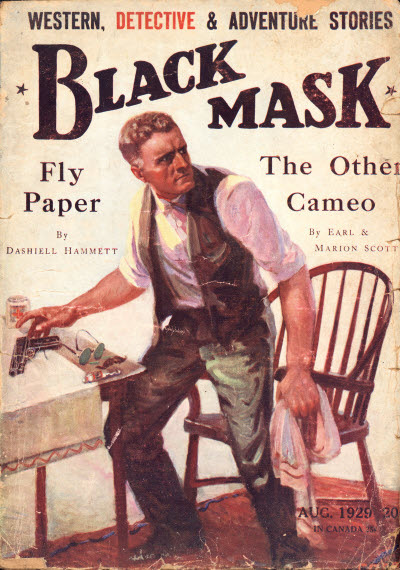 But even among the excellent stories Hammett was writing at that time, "Fly Paper" has always been one of my favorites. First, it's simply a great detective story. As Hammett states in the first sentence: "It was a wandering daughter job." The wayward daughter of a wealthy man is living with a thug. The Continental Detective Agency is on retainer to keep an eye on her in case she gets into too much trouble. Then she vanishes from New York. When the father gets a telegram from San Francisco--supposedly from the daughter--asking for money and permission to come home--Hammett's unnamed Op is assigned to bring her the cash. But the woman waiting for the cash isn't the daughter. The telegram was part of a swindle, but the Op is able to get a lead on the girl. This soon leads him to a corpse--someone has been poisoned with arsenic soaked out of fly paper. He then sees someone else get killed--shot by a killer lurking outside an apartment window. An extended chase after a killer leads to a tense confrontation in an alley. Throughout all this, the plot unfolds in a logical manner. On top of the superbly told story, there is Hammett's usual terse but sharp prose and characterizations. There's also a wonderful good cop/bad cop scene when a suspect is interrogated. But I think what really sells it is a certain thematic undertone. By the end of the story, three people are dead. All three die essentially because they make dumb mistakes. These are mistakes made out of fear, anger or greed--thoughtless decisions that even a not-to-bright person should have realized were stupid. Three people die because they were essentially too dumb to live. None of them were very nice people, but it gives the story a forlorn sense of tragedy that lifts "Fly Paper" up from being just a well-told detective tale into an examination of how the worst aspects of our nature can often make us stupid. The story was adapted in 1995 for an episode of a cable series called Fallen Angels. Christopher Lloyd--someone I never would have pegged for playing a hard-boiled P.I.--doesn't look anything like Hammett's overweight Op, but still brings his own interesting take to the character. 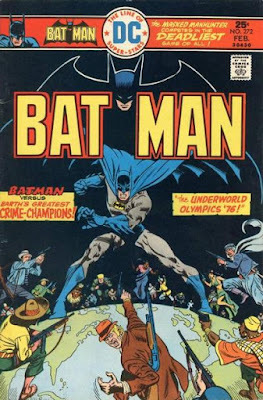 Batman #274 (April 1976) is the third part of the Underworld Olympics story arc that we began talking about last week. Writer David Vern (writing as David V. Reed) and artist Ernie Chan continue to take a potentially silly premise and turn it into a series of clever and entertaining detective stories. So far, the European and South American gangs have been tasked with pulling off a series of bizarre crimes, scoring points each time they are successful. But Batman, though he doesn't yet know about the Olympics, has foiled the final crime of each gang and sent a fair number of them to jail. With this issue, a combined Asian/African gang steps up to take its turn. "Gotham City Treasure Hunt" might be my favorite of the four issues. The crooks have to commit a crime to get a clue to the next crime--and so on until they find out what they have to steal to win the contest. There a particular element in this story that I simply love. 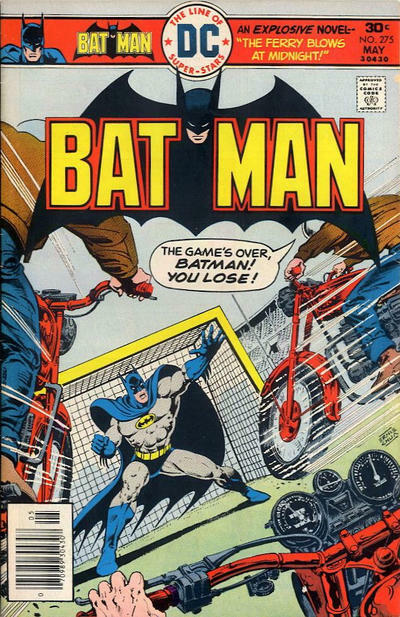 At one point, Batman captures two crooks after they gained a clue, but before they can pass this on to the rest of the gang. So they take advantage of TV news cameras to use "Cameroon hand signals" to pass on the clue to their confederates. Batman sees this as well, but the gang figures on this and manages to initially decoy him into a trap, where he faces off against a lady assassin. It's great stuff, with a clever script that shows a keen understanding of the different aspects of the Dark Knight. He continues to show a combination of deductive reasoning skills and martial artistry that should always be equally important elements of his character. Anyway, he manages to stop the gang before they commit their final crime. But there is still a North American gang waiting for their turn to compete. This gang gets its chance in Batman #275. But their crime depends on using a ferry boat that has recently stopped its service due to Gotham City budget cuts. So the first thing the gang has to do is rob a local criminal, then donate that untraceable money to the city to put the ferry back in service. From there, we get a story nearly as clever as the one in the previous issue. 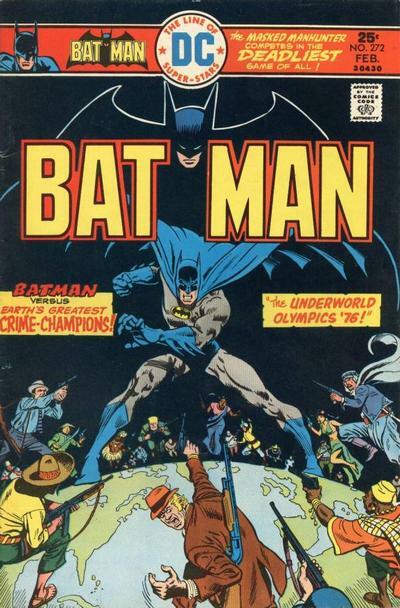 The gang's crimes build on each other and are supposed to end with the destruction of the ferry, but Batman has by now figured out what is going on--including the fact that there is an Underworld Olympics being held in Gotham. He saves the ferry and catches the gang. One of the gang's getaway boats is blown up, which fools the Olympic judges into thinking that the North Americans have succeeded. But in reality, Batman has finally tracked them down. The Olympic chief calls Gordon to gloat about what they've been doing. Gordon takes the call--on his car radio as his men surround the criminal Olympians. I mentioned last week that the premise of the Underworld Olympics feels more like a Silver Age than Bronze Age idea to me. But in its execution, it is very much a Bronze Age story. 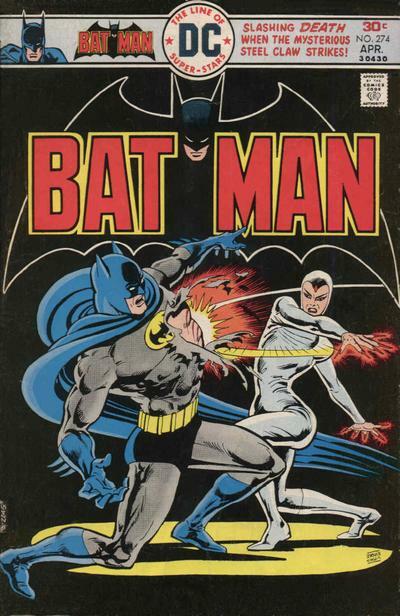 The 1970s really was the Decade of Batman, with writers and artists who understood how to write for the character and gave us solid, astutely-plotted stories. 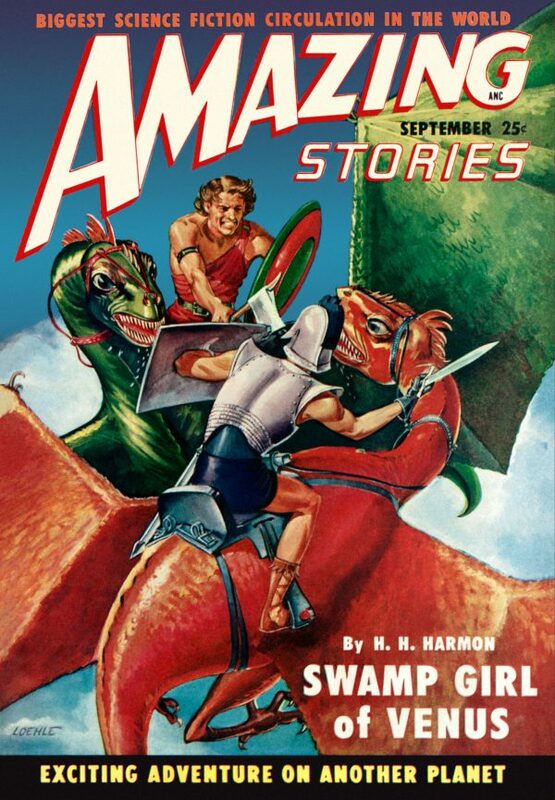 Next week, we'll be hanging out with Wonder Woman as she battles ALIEN DINOSAURS FROM SPACE! I can't describe how much I enjoyed writing that sentence. Excellent cover on this U.K. edition of a Perry Mason novel. The artist is Sam Peffer. Ellen's boyfriend needs $10,000 immediately or his life will be ruined. At least, that's the story he tells Ellen. She decides to temporarily "borrow" the money from the store she works in to help the man she loves. He's promised to pay the money back before the store reopens on Monday. This week and (at least) next week, I'm going to be looking at short stories that have always been particular favorites of mine. I picked stories that I inevitably re-visit at least once a year, both written by favorite authors of mine. But though these tales are prime examples of why these authors are considered fantastic story-tellers, I make no claims that they are the best of the best. They simply speak to my inner... well, my inner whatever. Perhaps they speak that part of me that is convinced--however irrationally--that I myself could be a skilled adventurer or successful detective. Perhaps the deeper themes in these stories speak to me on a more intellectual level. Or perhaps I simply think they're really cool. 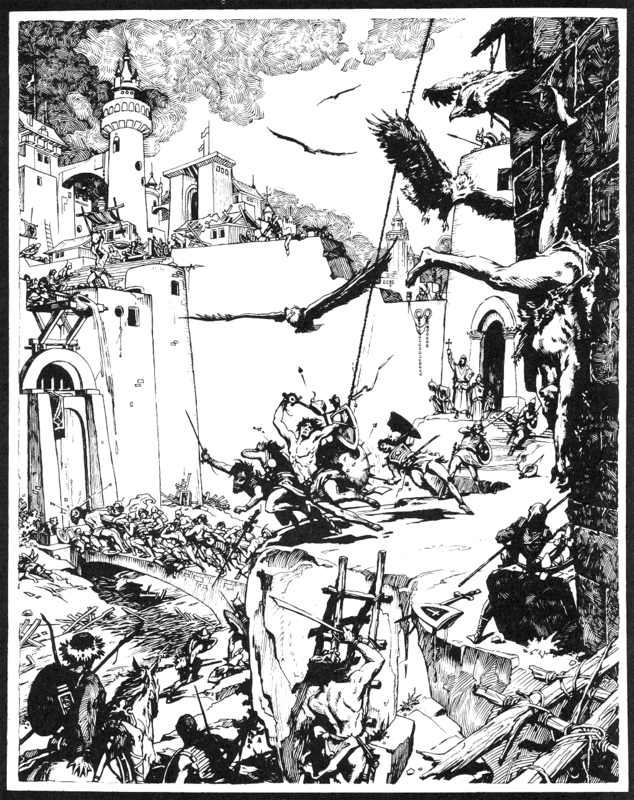 The anthology, with great interior illustrations by Roy Krenkel, had four novellas and short stories set (with one exception) in the Middle East during the Crusades. All of them are wonderful stories and "The Shadow of the Vulture," which introduced the world to Red Sonya, is probably the most influencial of the four. "The Shadow of the Vulture" actually is another story I frequently re-read, because no man can read about Sonya and not fall madly in love. But it is antholgy's title story that stands out for me the most. 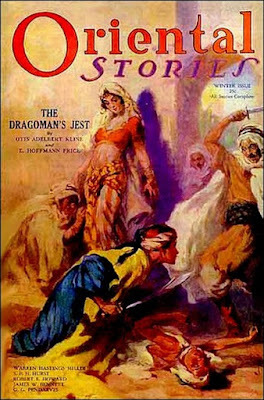 First published in the Winter 1932 issue of Oriental Stories, it is set in Palestine in the years 1243 and 1244, recounting the adventures of Cahal Ruadhl O'Donnel (Red Cahal), a man who had once ruled Ireland. But after a betrayal that involved the woman he loved, he is now a penniless adventurer, traveling east to join the Crusades essentially because he doesn't have anything else to do. Red Cahal is a creation of Howard, but the story does revolve around historical events--though Howard largely fictionalizes them. 1244 was a busy year. Jerusalem was sacked by a huge band of Turkish horsemen; the Western knights were decisively beaten at the battle of La Forbie; and a general in the Egyptian army began his efforts to eventually become the ruler of Egypt. Red Cahal turns out to have a role in all these events. And he's the perfect character to do so. We will be seeing the breaking of the power of the Western Crusaders, to whom Cahal has allied himself. The losses he's already suffered and his melancholy nature work as thematic linchpins to the events around him. But all this melancholy does not get in the way of telling a truly exciting adventure story. Cahal is traveling with a small band of knights when they are overwhelmed by a horde of 10,000 horsemen, riding down from Turkey to escape the Mongols, but destroying and conquering themselves along the way. Cahal is the only one to hack his way clear and tries to warn Jerusalem of the approaching danger, but there's simply no time. The horde sacks the city and slaughters thousands of citizens, descerating both Christian and Muslim locations. Cahal again hacks his way free and eventually joins up with the remnants of the Christian armies, who in turn have teamed up with some Muslim forces to face off against a mutual enemy. But what about the Egyptians? They are marching as well and rumors are they may team up with the Turkish horde. If so, the makeshift Christian/Muslim army is doomed. Cahal is asked to be an emissary to talk to the Egyptian general Baibars and find out what the heck is going on. Treachery, desperate escapes, a bloody battle and a doomed last stand all quickly follow. Throughout all this, Cahal keeps running into the same guy--though the guy is using a different name and occupation every time they meet. It can be argued that a weak point of the story is that it's really not that hard to figure out who this fellow really is, but the revelation of his real identity is still dramatically effective. There's also a Masked Knight whom Cahal meets right after escaping Jerusalem. That's another identity that will be revealed at the story's climax. "The Sowers of Thunder" is a fantastic adventure story and that really is 99% of the reason I return to it regularly. But it also deals very effectively with the ephemeral quality of temporal power and glory. In the end, a man is on his way to becoming a king. But, as Cahal points out and himself knows all too well, the glory is a witch-fire and the gold is moon-mist. No matter how skilled, smart or ruthless a king may be, nothing he does is permanent. 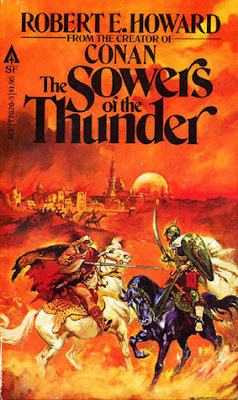 You can read "The Sowers of Thunder" online HERE. Next week, we'll look at another favorite story and do some detective work in 1920s San Francisco, working on a case where a number of people die essentially because they are too dumb to live. If you are going to hold an Underworld Olympics, it seems to me that Gotham City is possibly the worst location at which to hold the event. Gee whiz, a competition involving pulling of bizarre crimes (and scoring points comparably to the level of success) should NOT be held in a city watched over by the second-greatest detective in history. Especially when that detective has always specialized in solving bizarre crimes. It's just not a good location for the event. But, in Batman #272 (February 1976), that's just what four different international gangs choose to do. They sneak into Gotham and each gang randomly selects an envelope detailing a multi-part crime to be committed. I'm assuming that writer David Vern (writing as David V. Reed) or the editors at DC decided to do an Olympics-themed story because the upcoming summer Olympics were going to be held in Montreal that year. Without the worry of extreme time zone differences and several U.S. athletes expected to do well, there was a lot of Olympics enthusiasm in the Games that year. So DC decided an Olympics story would be a good idea. That's just a guess, of course, but I think it makes sense. Anyway, this first issue of the four-part story (with art by Jose Luis Garcia-Lopez) gets the story off to a strong start. The South American gang is up first, tasked with staging a murder to look like an accident, then later stealing the body from the morgue and hiding it elsewhere. To me, the premise feels like it would have been a little more at home in the Silver Age than the Bronze Age, but the script plays it straight and Batman is repeatedly shown using real detective skills throughout. Besides, its fun to get a story that throws us back to an earlier era in comic book history from time to time. Batman manages to partially foil the crimes, though he has no idea yet why South American criminals are pulling off apparently senseless capers in his city. And the Dark Knight soon discovers that the case is far from over. Ernie Chan, who inked the first issue, takes over as artist for the remaining three. 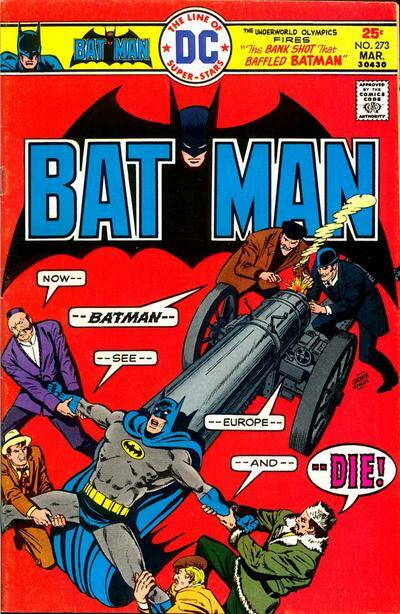 In Batman #273, the European gang is up, stealing a Revolutionary War-ear cannon to start of their event. That's followed by a bank robber, though complications ensue when some local crooks rob the same bank at the same time. But the gang soon ends up with both money from a specific safe deposit box and the cannon. Batman, though, has figured out that the gang is going to use the cannon to shoot the money to a remote location outside of police roadblocks. He employs Alfred as a spotter, allowing him to ambush the bad guys as they try to recover the loot. As I said earlier, the strength of the story is a combination of playing the silly premise straight and Batman's portrayal as a highly skilled detective. I maintain that during the 1970s, writers at DC struck just the right balance between Batman's major traits--detective, escape artist and martial artist. It is perhaps main reason this is my choice for the strongest ever Bat-Decade. So at the end of Batman #273, the South American gang has 20 points, with the Europeans pulling ahead with 50 points. Next week, we'll see how the other gangs do in their crime-related events. Why don't Ice Cream Cone Holsters exist in real life? 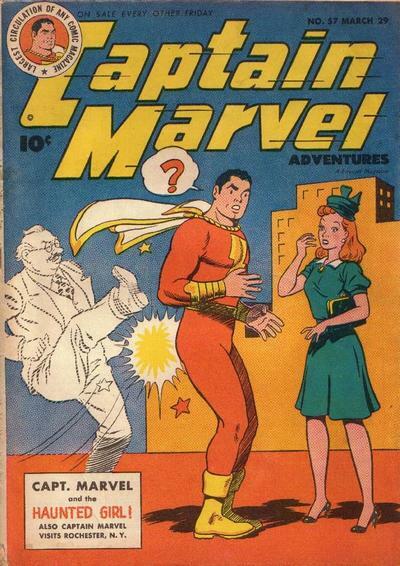 From 1959; art by Phil de Lara. An outlaw hid his loot in an abandoned building before being captured. 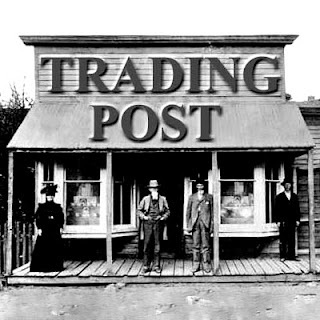 He's out of jail now, but the building has been turned into a trading post. He'll have to dispose of the two old-timers who run the post before he can recover his ill-gotten gains.